Purchase a tax-advantaged permanent life insurance policy with your adult child as the life insured and the designated contingent owner. Your grandchild (the child of the life insured) is named as the beneficiary of the policy. By transferring your non-registered assets into the policy, you’ll reduce your future annual tax burden. Funds invested in a tax-advantaged life insurance policy allow for accumulation of cash value inside the policy (within legislative limits), and you don’t have to pay income tax on this growth. At your death, because of certain income tax provisions applying to life insurance policies, you may transfer ownership of the life insurance policy to your adult child (who is the only life insured on the policy) without your estate paying any tax on the cash value growth. 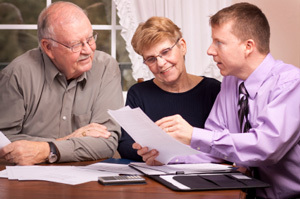 The transfer is also free of probate, executor and legal fees. Upon the transfer of ownership of the policy to your adult child, he or she will have access to the cash value in the policy while he or she is living. Alternatively, your adult child can maintain the policy to be passed on at their death to your grandchild as a death benefit, again without taxes, probate or legal fees. The cash value in the policy remains completely accessible and in your control while you’re alive. Contact Solutions Financial today and they will customize your life insurance coverage and match your investment goals with your risk tolerance. All comments related to taxation are general in nature and are based on Canadian tax legislation, which is subject to change, and apply to Canadian residents. For the implications as they relate to individual circumstances, consult the appropriate legal, accounting or tax expert.